Winter is on its way, which means there's just a little time left to get outside and enjoy the last vestiges of foliage, fresh air, flannels, and some rugged outdoor adventure before the cold properly hits. 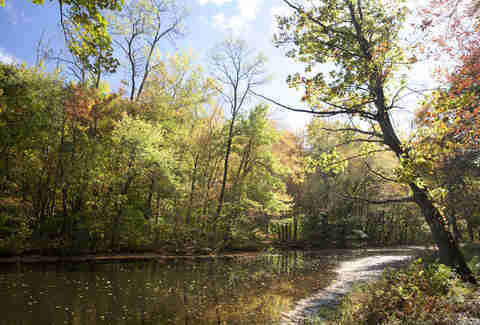 If you’ve exhausted these secret hikes near NYC and the best hikes in upstate New York, consider the following rail-to-trail routes that you can access just by hopping on Metro-North, from the nation’s first Natural History Landmark, to a birder’s paradise, to a glamping hideaway. This is your trusty no-brainer adventure. 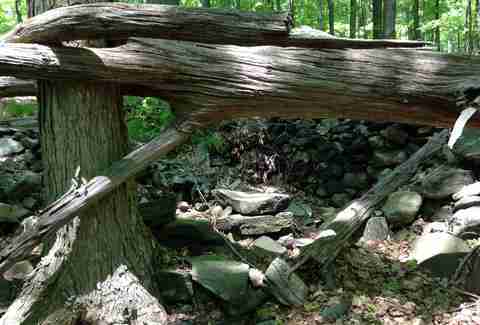 Moments after disembarking, you’ll see a sign for “Arden Point – Hudson Highlands State Park.” The 2.5-hour hike takes you by waterfalls and streams and along a Revolutionary War road used by the traitorous general Benedict Arnold. Though you’ll plan to gaze out the window on the train ride back, you’ll probably just end up toiling over which of the 200 dramatic panoramic photos from the banks of the Hudson River you should Instagram. When the beach crowds clear out for the season, Connecticut’s first state park takes on an edge-of-the-earth beauty that can’t be missed. 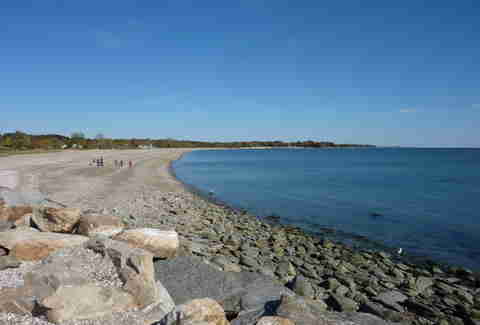 There are 234 acres of wildlife-rich woodlands and waterfront to roam, as well as a 1.5-mile beach walk along the Long Island Sound. Pick up a sub at Fortuna’s Deli in town, then take a five-minute cab ride to the park. Once you’re feeling fueled by a Chiquita "Yo' Mama" Ferrero Nutella & banana crepe and cold brew from Peekskill Coffee House, walk 1.5 miles out of the sculpture-dappled town to the various scenic trailheads within 1,800-acre Blue Mountain Reservation. 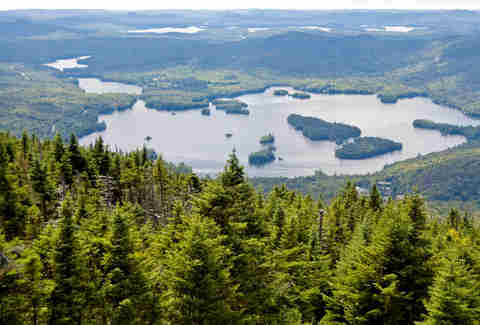 There are challenging hikes, like the climb to the top of Mount Spitzenberg or Blue Mountain, as well as the easier Dickey Brook and 12-mile Briarcliff-Peekskill Trail. Whatever route you take, don’t head home without a local pint at Birdsall House’s beer garden. 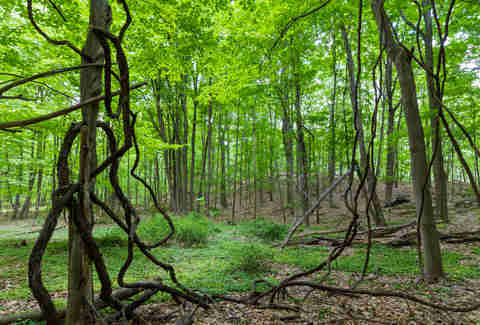 The Mianus River Gorge is the nation’s first registered Natural History Landmark, yet this lush 738-acre preserve has remained a hidden gem, left seemingly untouched for the bobcats, white-tailed deer, and probably unicorns (seriously, the forest glows). It’s worth the 10-minute cab ride from the station to experience the well-marked trails, which are a visual feast, with Havemeyer Falls, an 18th-century quarry, gushing Mianus River, and 350-year-old hemlocks that loom over 100ft tall. The now-decommissioned Croton Aqueduct that began supplying water to NYC in 1842 has become the crown jewel of Westchester workouts. 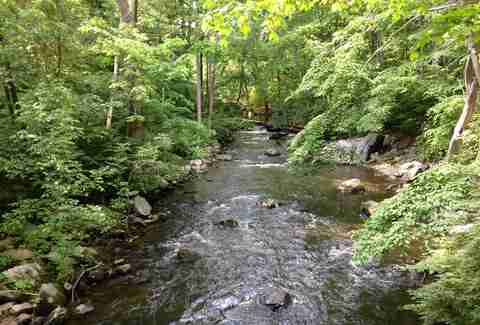 This level stretch of the 26-mile trail runs under a canopy of oaks and willows from Tarrytown to Yonkers. 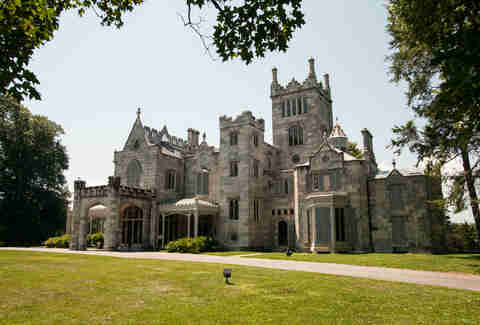 Along the way, you’ll encounter quaint villages, beautiful Hudson River views, stone bridges, and a few surprises, like the historic estate Lyndhurst mansion. 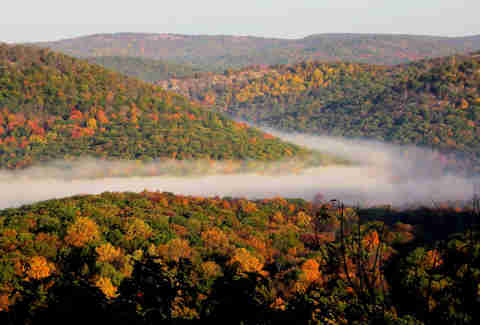 The absurdly beautiful start of this hike is worth the trip alone. 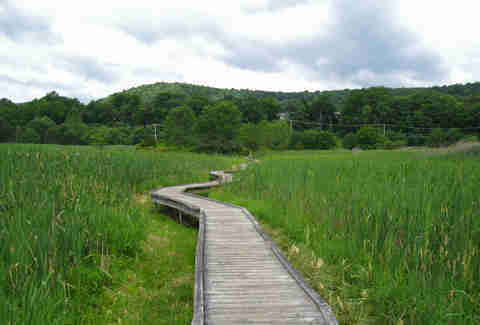 Whether you go 7.2 miles up to Cat Rocks for the expansive Harlem Valley views, or traipse 5 miles along the Appalachian Trail through the Pawling Nature Preserve, the initial 1,600ft Swamp River Boardwalk slithering through the wilderness is already all the nature fix you need to make it a memorable weekend. A disclaimer here: it’s shockingly easy to get lost on any number of the 33 well-groomed trails in Rockefeller State Park Preserve, face-plant while running towards a field of grazing sheep, and still have the best hike of your life (don’t ask how we know; we just know). 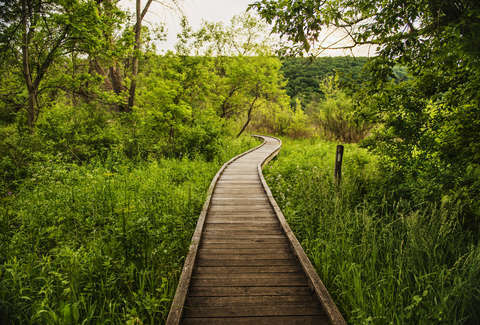 There’s bits of magic around every bend, be it on the .75-mile Buttermilk Hill trail up to the highest point in the 1,400-acre preserve, or the 1.9-mile 13 Bridges Loop, which traverses 13 bridges deep into the forest. Before taking a 10-minute taxi back to the station, walk next door to Stone Barns, home to Blue Hill, one of the best restaurants in NY not in NYC, to fix a picnic and giggle at piglets. You could walk across the GW Bridge to Fort Lee where this 357-mile trail begins, but that would be too easy. Set aside a fall weekend to explore another section of the aqua-blazed (but really orange-yellow-red-blazed) Long Path in Harriman State Park, where the craggy yet rewarding route offers caves, lakes, an aptly named Hippo Rock, a Long Mountain summit, and shelters that were built in the 1920s. After hitching a ride from the station on the hiker shuttle, courtesy of the recently opened Appalachian Mountain Club’s Harriman Outdoor Center (one of a few reasons to plan a weekend getaway), get a taste of this under-the-radar trail, then return to your AMC dwellings for a sunset dip in Breakneck Pond and a beer, best had in an Adirondack chair on the dock. Car-free glamping near the city doesn’t get better than this. When you book a Metro-North-packaged getaway with Malouf's Mountain Sunset Campground (it’s not as hippy-dippy as it sounds), a shuttle will pick you up at the station and drop you at whatever hike you fancy (there’s also the 6.5-mile Fishkill Ridge Trail) while they bring your gear to base camp. 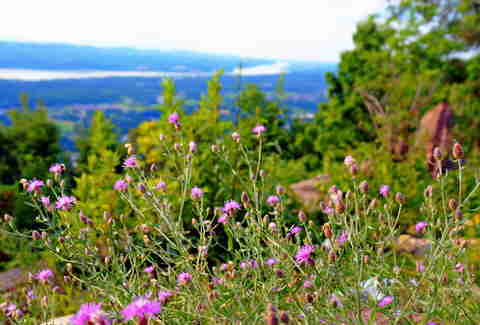 The Mount Beacon Trail is a classic, offering an enjoyably strenuous route up to the fire tower, where you’ll be met with spectacular 360-degree views of the Hudson Valley. This 363-acre preserve is an especially thrilling natural break during the autumn hawk migration, when you can spy on various raptors from up in the Hawk Watch. Download The Nature Conservancy’s audio tour and revel in an uncommon adventure through a birder’s paradise. Even if you aren’t big on ornithology, this will go down as one of the wildest hikes you’ve ever experienced -- one that’s totally worth the train trip (plus 10-minute cab ride). Lauren Matison is a travel writer and co-founder of offMetro.com who can be found tracking unicorns in Mianus River Gorge on weekends. Follow Lauren on Twitter and Instagram.